You have 22 minutes until your kids will be home from school and you want to finish reading as much of your latest book as possible. You are relaxed, kindle clutched in your hands, you exhale and begin reading. You tell yourself, twenty-two minutes and no distractions. Then it happens. Just a little at first. A small persistent itch in the middle of your back. You know you do not have much time, so you try to remain focused on your book. Keep reading, it will go away. It doesnt stop. Now it is growing stronger and you find yourself unable to comprehend what you are reading. Gotta scratch! Gotta scratch!! Oh my goodness! Scraaaaatchhhh!!!!! You drop the kindle in your lap and head straight for the attack. Except there is only one problem: You cannot reach it. No matter which angle you try, the itch is just out of reach of your fingertips. Now you have to jump up, find the nearest corner in your house to slide your back on - back and forth - until it goes away. Those 22 minutes? Now you are down to about 8. Has this ever happened to you? Can you relate it to a similar situation? How many times have you had something that you wanted to do and, no matter how hard you tried or how meticulously you planned, something kept you from doing it? Proverbs 16:9 (NKJV) tells us that, "A man's heart plans his way, but the Lord directs his steps." Though, if you really think about it, sometimes it is as if we pull up our britches, put our thumbs in our ears, wiggle our fingers and stick our tongues out and tell God, "Thanks, but no thanks...I prefer to make my own route." I do not know what in the world makes us think we can tell God which way we want to go. Yet, we do. All the time. Perhaps a better suggestion would be to follow what Jesus said in Matthew 6:33 (NKJV), "But seek first the kingdom of God and his righteousness, and all these things shall be added to you." See, Jesus says, "For where your treasure is, there your heart will be also," Matthew 6:21. Our treasures are our desires. They are our likely selfish wants in life. 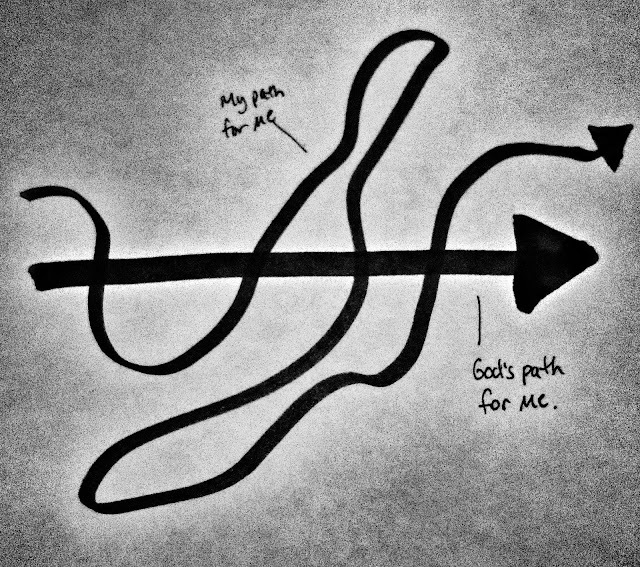 If our eyes are not focused on God and letting him direct our paths, then our hearts are following the wrong treasure. If you want to read and you get a persistent urge to do something else (i.e. scratch yourself) -- is that a coincidence? Is the itch merely just an itch? Or if, on the way to head out to a late night movie you suddenly get a strong urge to watch a movie with your kids at home instead. Do you think it is coincidence? Maybe some connection with your child that night is meant to come back to them later on in life? Maybe they would have missed that if you weren't there? You go to college to become a defense lawyer. You give up a huge chunk of your life to studying and finally finish. Your plan is to score a position with a big firm, making enough money to live a very, very comfortable life. Instead, you find yourself working in the Public Defender's office and your heart gets filled by the indigent folks you come in contact with. You cannot seem to quit. That very comfortable life came about, just with a different treasure than money. Coincidence? My point is, God always has us on a path. We may make our own route (or at least think that we are) but those are just simply short detours. After all, I am sure God knows some of us will meander a lot more than others. He is always there trying to pull us back. Some urges are extremely persistent and they don't go away until you address them. And, quite often, when you direct your attention to that urge, you may discover a greater peace at the end of that particular path. Was that God? I like to think so. This blog came about because of an extremely persistent urge. Perhaps it is meant for you. There are no coincidences in life. Listen for God. If you don't hear him, ask him to show you. Then be patient.